Welcome to the 127th Tablescape Thursday! A few months ago, I came across flavored chocolate “coffee spoons” at Marshalls. The flavors are: Hazelnut, Mocha, Mint, Irish Cream, French Vanilla and Amaretto. On a trip to Trader Joes I decided to try their gingerbread. Do these not sound like the perfect winter “comfort” foods? They also sound like the perfect ingredients for a Valentine’s Day breakfast. China is vintage International, pattern is Glenwood. I found most of it while antiquing and filled in with what I needed from eBay. The last time I made these little heart shaped cakes for valentine’s Day, I just sprinkled them with powdered sugar and filled them with raspberry preserves. This time I filled the center of these little heart-shaped cakes with icing that I made and tinted pink. My sweet son gave me a beautiful orchid for my recent birthday and it worked beautifully in this Valentine’s Day breakfast. 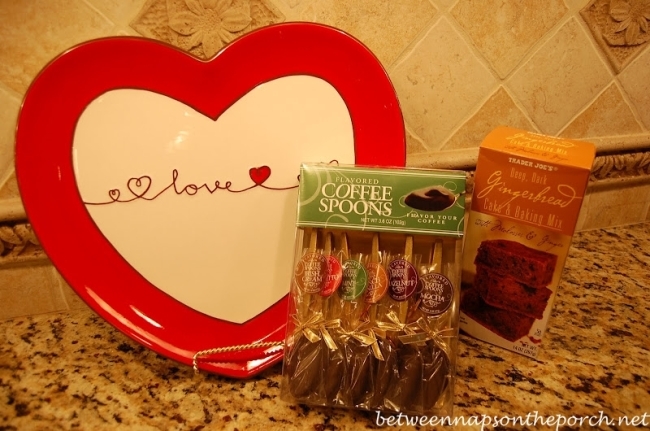 Love these chocolate coffee spoons for flavoring coffee. Hope you enjoyed this Valentine’s Day breakfast. 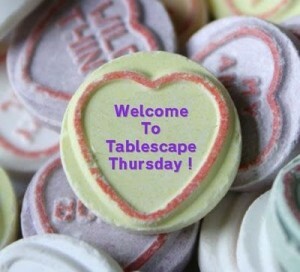 If you’d like to use the Tablescape Thursday logo button in your post, just copy and paste it to your computer and upload it to your post as you would any photo. Or, just grab the html code you’ll find under the “Join a Party” heading at the top of this blog. Please, link back to the host blog, Between Naps on the Porch. 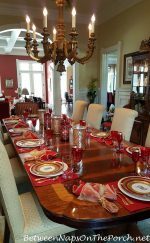 This is important because it helps those who are visiting your blog, find the other wonderful tablescapes posted for this Tablescape Thursday, thus increasing visits for all participants. Please, don’t add your post name/blog name in ALL CAPS…it tends to create big spaces between the rows of links. Thanks! I just adore breakfast in the bedroom. What a great idea for Valentine's Day. My husband has been sooooo supportive of my blogging, that he deserves this kind of treatment this year. Great idea, I might just have to do it. Susan, I like your idea of what constitutes breakfast! So many pretty and yummy things on the menu! The table looks lovely — so romantic with the lace and pink! I enjoyed your Valentines tablescape very much! Wow, how very pretty, pink and valentiney 😉 I'm so glad you used your birthday orchid. Your dishes are perfect and the candlelight is beautiful! Your bedroom is so lovely. 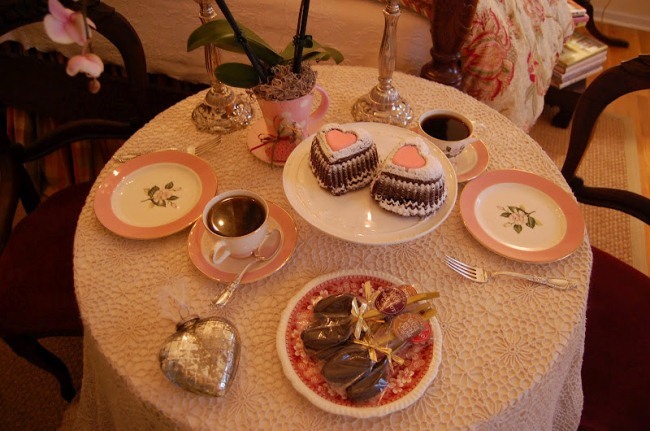 Love your dinnerware, Susan, and the little cakes are adorable! Beautiful breakfast in your bedroom. I just love your chandelier in your bedroom. The gingerbread looks wonderful too. Susan, looks like a wonderful retreat for a cozy and tasty breakfast. The little cakes look pretty, and because they are gingerbread I'm really going to enjoy one of these. What a lovely breakfast. Love how you changed the heart cakes. They were great the first time and wonderful this time too. Susan, what a darling tablescape! I just love it! And those cakes are precious. Love your orchid, too, and I want you wish you a very Happy Birthday! Your kitty is the cutest. Happy Tablescape Thursday. I did an un-birthday this week, but I guess I need to change that to wish you a happy one! Such a pretty tablescape "tucked into" your bedroom. Looks yummy, too! Stop by and enter my celebration (100+ followers) giveaway if you get a chance. I love the china,so perfect for Valentine's day. And the little cake hearts and the beautiful flowers add such a charming touch! Susan — what a lovely romantic breakfast setting — looks beautiful! I'm off to visit tables! I always love seeing this china, and it's a perfect choice for that beautiful room. Beautiful!! What a romantic tablescape! Your china pattern is gorgeous! I'd prefer the raspberrry filling, if you please, but then I might want to try the pink icing, as well! Max is way too relaxed. . .Maurice would have been seated opposite your chair waiting to have her photo taken! HA! Enjoy your table set for two! Lovely little cakes!! The kitty has the right idea on a cold day…. If you like toile stop by as I am having a giveaway. Oh my..how beautiful and romantic!!! Happy Belated Birthday! Love the tablescape. Those cakes are the cutest! Oh, Susan…I love this beautiful post. It is one of the warmest and most real and I love every single thing about it. Your breakfast table, with the beautiful hearts, for two, is so so pretty. LOVE IT !! This is such a romantic setting. How pretty. Inspires me to do something other than toast. Thanks. That sounds like a great idea! Those heart cakes are so delish looking! Oh Susan, this is So Sweet. AND LOVE Kitty snoozing away while you are taking your pictures…"Too Cute"! What a charming, romantic, and inviting table for two! Candlelight and chocolate — two of my very favorite things … pure indulgence! I hope you had a very happy birthday! The orchid from your thoughtful son is truly beautiful — a fitting tribute to his devoted, talented, wonderful mom. The cakes look delicious! I just re-visited your hunt-themed table for two by the fire in the "library" yesterday (one of my favorites of all you've done). Are these are the same chairs and tablecloth/coverlet? Absolutely gorgeous! Your creative energy is such an inspiration to us all. Thank you for your gracious hospitality. Happy Belated Birthday! What a great idea to celebrate V's day with breakie in the bedroom…and what a delicious one you've prepared! Looks very cozy and inviting! My what a romantic tablescape that could ever be seen first thing in the morning. Its like love has captured every space in the room. Charming. I remember these little cakes from last year and promised I would make them this Valentines Day for my DH. Thanks for reminding me! Your bedroom looks so restful and a perfect setting for two. Enjoy. Thanks for hosting! The heart-shaped cakes are adorable – love the ones with pink best. And that mercury glass heart is wonderful! Your Linky thing didn't work for Mel's Cabin Romance…sorry no picture for ya! This table is so beautiful and very romantic. My favorite thing is always your gorgeous sterling! Your cakes look wonderful and I'm sure are delicious!! I am certainly familiar with that sleeping beauty on your bed…we have three and they all have perfected the art of sleeping, but I guess that's just what cats do!!! So lovely!!! Went back to look at your 2009 post….wondering if those cake pans at Michael's also come with a recipe for the cake from Wilton….would be a plus! Thank you for sharing your delectable ideas! The heart-shaped cakes are darling. What a great idea for Valentine's Day. And I love your cute fluffy cat. Love your beautiful bedroom. I have the same plaid fabric on my headboard. Love the colors. Your tablescape is just amazingly charmin' girl but this Ozark Farm Chick is quite taken with your bedding!!! Girl your bed is just gorgeous!!! Just sayin….. Sorry, but you made that whole scene just so beautiful and inviting that you might have some strangers come knocking! It's so, so lovely. Well, if this doesn't make me want to say "Awwww…" I don't know what does. How completely and totally romantic! I LOVE those little heart-shaped pastries. I think a new pan is in my future. What a romantic setting! I love the orchid from ds and the treats look delicious! I absolutely love this tablescape! Everything looks so inviting. I also love that you incorporated the orchid from your son in it. BEAUTIFUL! What a beautifully romantic table scape. And what a sweet son to gift you with such a beautiful flower. It's perfect for the Valentine's breakfast table. TY for giving me an inspiration. The American style. Now, I have some hints how my ideas, my 3 world combine together. Filipino-Swedish-American style, not bad, huh? How lovely and cozy, Susan! Lovely! I wish my room were big enough to host once in a while breakfast tables. Your room and table look so cozy. Glad to see you're doing wonders with the orchid. everything's perfect for the occasion… i love it susan! Oh my! ~ Really the whole tablescape and your prettiest of bedrooms is utterly charming! Thanks so much for hosting once again Susan. 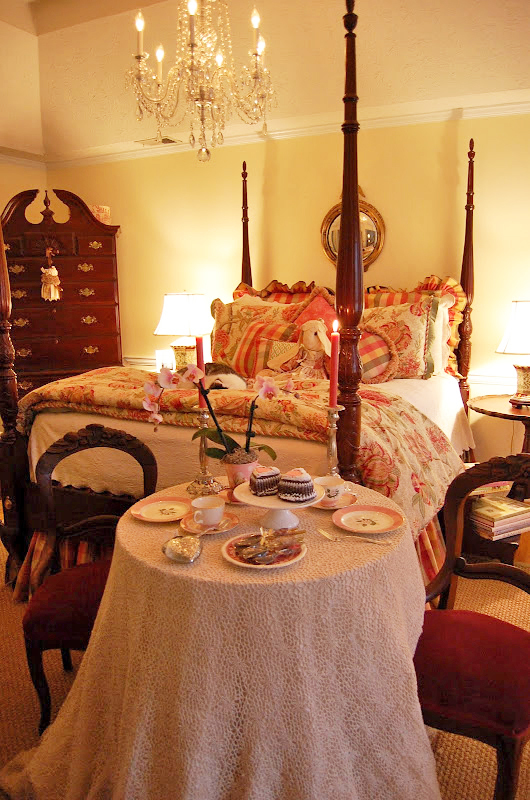 My friend, it would be such a treat to have breakfast in that beautiful bedroom anytime! You know that I just adore your bedroom! Well my dear, you set the prettiest breakfast table ever…so soft and romantic too! Ohh my…your pink orchids are just gorgeous…how sweet of your son! I'm sorry that I missed your birthday, dear friend! My apologies! I hope that you had a fabulous one! Happy belated Birthday! I love the little heart cakes that you make! 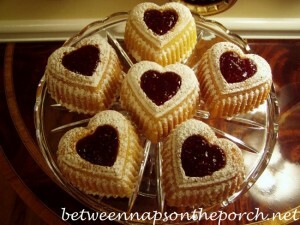 When I seen the raspberry filling hearts…I swooned! Raspberry is my favorite flavor and fruit! But I must admit the pretty pink frosted hearts look scrumptious as well! Ohhh…and please same the amaretto flavored chocolate spoon for me…my fav!!! Thank you for sharing this lovely breakfast table with us, my friend…this was such a treat! Also..thank you for hosting TT! Happy belated birthday Susan! Boy those little cakes are pretty. 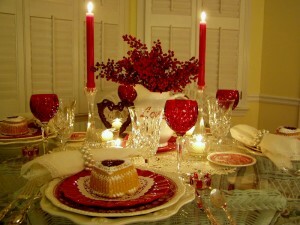 I love anything heart shaped and edible ;o) A breakfast tablescape is the perfect way to start the day! Ahh! This is so gorgeous and romantic! I love it! Gorgeous! everything looks so romantic and cozy! What a lovely Valentines Day breakfast. Beautiful orchid! Happy Belated Birthday. Gorgeous, romantic and sweet! I'd love those cakes I know!! Happy pink week and Happy Birthday! It all looks so pretty and romantic, Susan. Will you do this again for Valentine's Day? home. You are a source of inspiration ! Your pink antique china is just lovely ! I love your heart shaped cakes…is the pan available to purchase ? If so where? My hubby is a Valentine baby, so I think this would be a great way to serve breakfast on his special day. LoVe your table scape ! Thanks, Marg! He will feel so loved and appreciated…I know I would. 🙂 How cool to have a birthday on Valentine’s Day…love that!